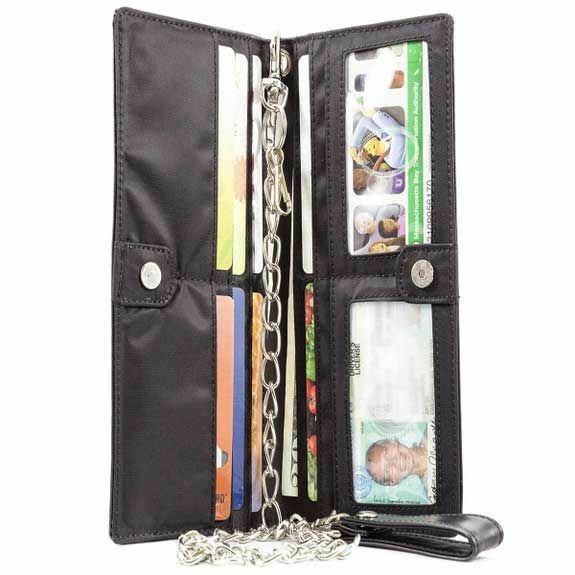 Hit the road with our motorcycle wallet with chain from Big Skinny that will secure all your stuff. Take off the chain, and it's an executive checkbook wallet. 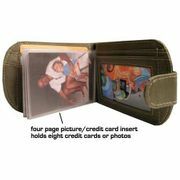 Our wallets are skinnier and hold more because of the high-tech nylon microfiber construction. We add more compartments to hold your cards, cash and papers, and we add a no-slip coating inside each pocket for extra security. Our metal snaps are extra tight, too. This motorcycle billfold is made tough enough to make long-haul truckers happy. Inside this full-sized motorcycle-style wallet are two billfold/checkbook areas and seven extra-wide credit card pockets. It also has an extra-wide ID/credit card pocket. Our wallet pockets are extra wide, because we don't want you to waste time tugging to get your card out like you did with your old wallet. A magnetic snap closure is centered on this wallet. The 20-inch metal chain has multiple attachments. The wallet is only one-third of an inch thick when closed. It measures 7 5/16 inches by 3 1/2 inches in size. Enjoy that next road trip. only ⅓" (4 mm) thin when closed! I didn't think I would like a non leather wallet. I was wrong. This is a great wallet. Its a lot thinner and I like the way all my cards fit in it without overlapping . My last wallet was leather and had a snap that damaged some of my cards. Bought my first Motorcycle Bifold Wallet about 2 years ago. Still using it. Love it because it's Vegan and unlike previous leather Motorcycle wallets, it's not constantly reminding you it's in your pocket (i.e. pain in the b*tt). I recently purchased two more as the original chain grommet has been semi-torn from it's position (chain getting caught on things-been dealing with that for over 35 years). In comparison to it's leather counterpart, the Big Skinny MB wallet is so affordable I can just replace it every few years. It really comes down to ethics and comfort. While a leather wallet may last longer, it's a constant reminder of who had to suffer for it. Thankfully I discovered Big Skinny and the MB Wallet is the EXACT replacement I searched high and low for. I gave a review in 2011 when I got my first Biker wallet. I was very happy to see when I received my 2nd wallet you had taken my suggestion and got ride of the zipper coin pocket. I know using a heavier chain would drive up the price, but I had to replace the chain on both biker wallets. Doesn't really matter to me now. I bought as heavy duty stainless steel chain at a biker rally. The chain cost more than the biker wallet. But it will last me through many Big Skinny Biker wallets. My last one lasted over 5 years before wearing out. I expect this one will last as long. Proslight weight and looks great. I switched to this from an old Harley Davidson wallet that I had for the past 24 years. My old wallet was about 1 1/2" thick and was getting to be a problem. This one is about 3/4", with a most of the same stuff (although I left some stuff out, but not much). It's about an inch longer than my old wallet, which made it look really weird coming out of my back pocket. Also, I ended up removing the chain, because it was just really cheap and crappy. Since I had no chain and it looked weird in my back pocket, I put it in my front pocket and it fits alright there. A bit long, but only a bit longer than my phone that I keep in my other pocket. If I could go back, I'd probably get a different one, but this one works. No doubt slim, generous card slots. Best there is. Retired my bulky leather one. The leather took up more space than my contents. 3 years old, still going strong! I have used This Big Skinny wallet for 3 years now. I like to carry my bills flat. this is the best wallet for that. It's done everything I would expect out of a wallet. I wear a chain wallet full time, and yes, I replaced the 'starter' chain on this one with my custom made wallet chain, not a big deal, that's what we bikers do, we customize stuff! I never had a problem with the zipper messing anything up. It's fine by me. I keep my extra key and a couple quarters in there just in case. If you don't carry coins in your wallet, it's still a good stash spot for that extra key. a) This model Needs RFID protection! b) Maybe a 'deluxe' model with leather outer shell and RFID Protection! ConsThis model Needs RFID protection!